- 8 meter long delivery hose. 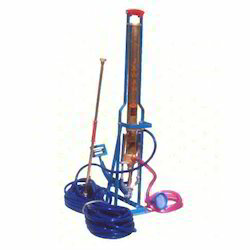 - 2 meter long suction hose with strainer. - Develops sufficient pressure to operate with two discharge lines with any length of hose. - Suitable for spraying with Highjet Spray Gun to spray on tall trees. - 90 cm. long lance with adjustable Nozzle. - Delivery Hose 8 meter long, can be extended. ASPEE GATOR rocking sprayer with 2 meter long suction hose with strainer, 5 meter long delivery hose, with Hyjet spray gun/VM3ND spray lance. Conforming to IS specification and with ISI mark. Backed with support of experts, we are engaged in offering a faultless range of Foot Sprayer to our valuable patrons. Moreover, we offer this product at nominal costs. 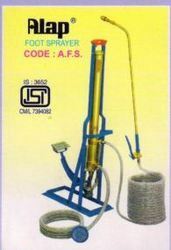 Foot sprayer with hi-jet gun 10 mtrs hose. Green Ventures Foot Sprayer is operated with operator's foot. The sprayer is robust in construction and is mounted on a stand made of mild steel. This machine mix pesticides, herbicides, and fungicides for application to trees, shrubs, lawns, or botanical crops. The machine is high in demand due ot its function and low maintenance cost.